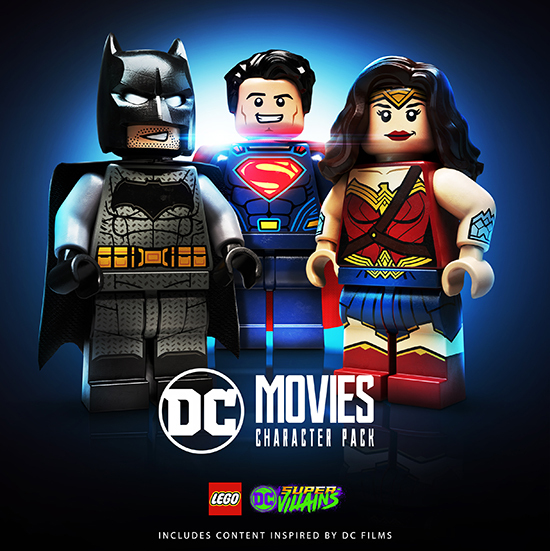 DC Movie Character Pack for LEGO DC Super-Villains on PlayStation 4, Xbox One, Nintendo Switch and Windows PC. The new pack features iconic DC Super Heroes and Super-Villains including Wonder Woman, Batman, The Flash, Superman, Cyborg, and Deathstroke each with a fresh look matching their appearance in the Justice League movie produced by Warner Bros. Pictures. Players can also play as the original, comic book version of these characters in the main game. In LEGO DC Super-Villains, the Justice League has disappeared, leaving Earth’s protection to a newcomer group of heroes from a parallel universe, proclaiming themselves as the ‘Justice Syndicate’. Renowned DC Super-Villains from the ‘Legion Of Doom’ discover Earth’s newest heroes may not be the heroes they claim to be. With each player’s completely customisable Super-Villain character in command, this team of misfits must join forces to discover and foil the evil plans the incognito newcomers have in store. Players will create their own supervillain character and set out on a journey to determine their character’s purpose within the story. Along the way, players will unlock new powers and customisations for their character, travel off the beaten path for additional story quests, puzzles, and mini-games to unlock rewards and recruit other DC Super-Villains, and cause mischief throughout well-known DC locations including Gotham, Metropolis, Smallville, and more.